In early spring of 1916, there was a young businessman in the city who owned and operated a chain of lumber yards known as the R.B. White Lumber Company. The man’s name was Raymond B. White, better known to his friends as “Bud.” He was from Kansas City, Missouri, where he had heard and ready about the activities of a service club which was called the Rotary Club. Bud was impressed with this club: its aims, its objectives, and its work. At that time, in the Arcade Annex, there was a cafeteria restaurant known as Kuster’s, which was a popular luncheon spot for many of the business and professional men in Newark. The first conversation about Rotary took place around the tables at Kuster’s with Bud White starting the promotion of the idea of a Rotary club here. Some of those first interested were E.C. Wright, J.M. Mitchell, Lawrence Krieg, Vern Priest, Frank Beggs, Clark Hutch, Howard Jones, Charles Spencer, Malcom Baker, and Don Tullis. This group got in touch with what was then the National Association of Rotary Clubs. 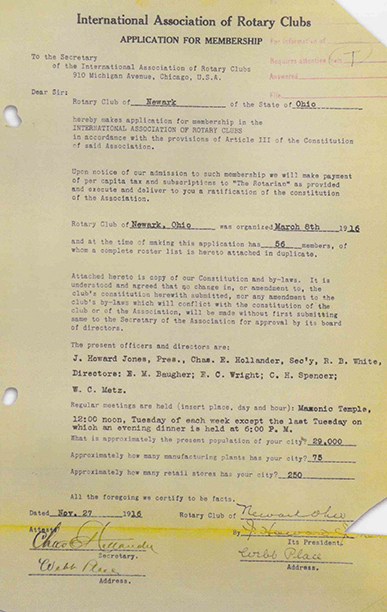 This was the spring of 1916, but apparently the group did not qualify for a charter until December 6, 1916. At that time, Reverend Don. D. Tullis was pastor of the Second Presbyterian Church in this city. He had organized a strong “Men’s Club.” There were between forty and fifty men in attendance at their monthly meetings. In 1916, it was decided to make this group into a weekly luncheon club. Few, if any, of these men had ever heard of Rotary at the time. They met on Wednesdays at noon in the upstairs dining room of McDaniel’s Restaurant located on the north side of the square just east of the Bazaar. One day some of the men spoke of a national men’s organization by the name of Rotary and suggested looking into the possibility of united with it. Uniting a religious organization into Rotary was not possible, but many of the men of the Presbyterian Men’s Club did join Rotary in the first year of its existence. 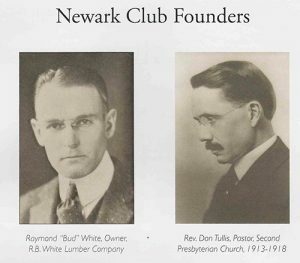 This nucleus of men was to become the Newark Rotary Club. The first meeting of which there is a written record occurred on May 9, 1916 with Wilson Hawkins, then Superintendent of City Schools as Acting Chairman. At the meeting, the entertainment committee chairman (which is now called the program committee) asked to be excused from providing entertainment. He then asked all present to tell what they wanted to do when they were boys. There is no record of what was said, but perhaps, after all, they did have some entertainment. Regular weekly meetings were held thereafter. From this humble beginning, the Newark Rotary Club has grown in membership to over 230 members. In 1987, Rotary International adopted a policy of allowing not only men but also women to join Rotary. In that same year, Newark Rotary’s first female member was Nancy (Shrider) Dix. Newark Rotary’s first female President was Molly Ingold 2000-01. On August 15, 1916, the meeting place was moved to the Masonic Temple where the Club met regularly until it moved to the Warden Hotel. When the Warden Hotel closed in 1958, the Club met at the Trinity Episcopal Church for six months before moving to the Elk’s Club. In January 1964, it moved to the Carousel on the east side of the square. In 1969, it moved to the YMCA. In 1975, it moved to the new Sheraton Hotel and remained there when the Hotel’s name was changed to The Best Western. In 1995, it moved to the Moundbuilders Country Club. In 2000, the meeting place returned to the Sheraton Best Western Hotel which became The Newark Metropolitan Hotel and later the DoubleTree by Hilton. On June 1, 1916, the first publication called “Rotary Index” appeared. It was paid for by twelve members paying two dollars each for an advertisement therein. In the early 1920’s, the name was changed to “Rotogram” and continues to be published weekly. In April 1917, the club fostered its first real project, an exposition of Newark merchants and manufacturers. This was held in a large frame building south of Main Street between Fifth and Sixth streets. The building was called the Tabernacle and had just been used for a revival meeting. It must have been a great success as a profit of $3,450 was made. This was divided with half going to the Red Cross and half to the YMCA camp program. On May 18, 1920, the late Dr. Homer Davis, returned from a conference of Rotary leaders in Elyria, Ohio. This conference was called for the purpose of doing something for crippled children. Doctor Davis was so full of enthusiasm and eager to have the club adopt this work that he addressed them for forty minutes telling what he heard and saw in Elyria and outlined the program. The club hired a nurse at $200 a month for six months and furnished her a car to make a survey of the crippled children in Licking County. These children were then brought to a clinic at certain times. Orthopedic specialists, usually from Columbus, were employed to evaluate each case and make recommendations as to operations, casts, braces, and any other equipment needed. In cases where the parents could not afford the costs, the club paid the bills. As more clubs in the state became interested, the Ohio Society for Crippled Children was formed under a state-supported organization. It still operates today as the Easter Seals Society. As other states adopted the Ohio plan for crippled children, it grew into the National Society and then, as the work spread into other countries, into the International Society For The Welfare of Cripples, by which name it is known today. The club still remains active in this field with its Children with Special Needs programs. Newark Rotary has been a consistent supporter of Rotary International. The club has been honored by having one of its members, Theodore D. Griley, serve as Director of Rotary International 1990-92, aid to Rotary International President Frank Devlyn 1999-2001, and a Rotary International Foundation Trustee 2001-05. There have been six District Governors from the club: Frank L. Beggs in 1927-28, Darrel S. Jones, Sr. in 1957-58, Robert C. Battat in 1970-71, Theodore D. Griley in 1976-77, Donn E. Alspach in 1988-89, and Robert McGaughy in 2003-04. The club has sponsored two other clubs in Licking County, Newark-Heath Rotary in 1985 and the Granville Rotary in 1949, which sponsored the Pataskala Rotary Club in 1998. Newark Rotary has hosted several sitting Rotary International Presidents: Pavlo V.C. Costa in 1990-91, Rajendra K. Saboo 1991-92 for the club’s 75th anniversary, Cliff Dochterman 1992-93, James L. Lacy 1998-99, Frank Devlyn 2000-01, and, more recently, Glenn Estees and D.R. Lee. The club celebrated 50 years of service to the community in 1966 with a very intense program of activities which recognized the business and industry of the area. CEO’s of companies addressed the club and received a plaque and gift in recognition of their visit. In addition, all Rotarians were invited to display their products and services at the weekly meetings. One of the highlights of the year was a trip to Braunschweig, Germany, to visit our matched district club. Eighty Rotarians and their families were royally treated by the German Rotarians and their families. In addition, the group visited with Rotary clubs in Glasgow, Copenhagen, and Luzerne. Other places enjoyed by the group were Amsterdam, London, Paris, Berlin, Rome, Madrid, and Lisbon. During the year, a number of Braunschweig Rotarians, including the club’s President and his wife, visited Newark. A directory and history of the club was also published. The anniversary dinner was addressed by former Governor John W. Bricker. Three Charter Members, Lawrence Krieg, Sam Alban and Thomas Evans, were presented with Honorary Membership (Evans was not able to attend). Twenty-five years later (1991), the club celebrated its 75th anniversary. A pictorial roster of all members of the club was published and the guest speaker at the anniversary dinner was Rotary International President Rajendra K. Saboo from India. The last of our charter members, Lawrence M. Krieg, died in 1974 after 58 years of membership. He was the club’s first Paul Harris Fellow. As of 2002, Newark Rotary had over 223 Paul Harris Fellows. 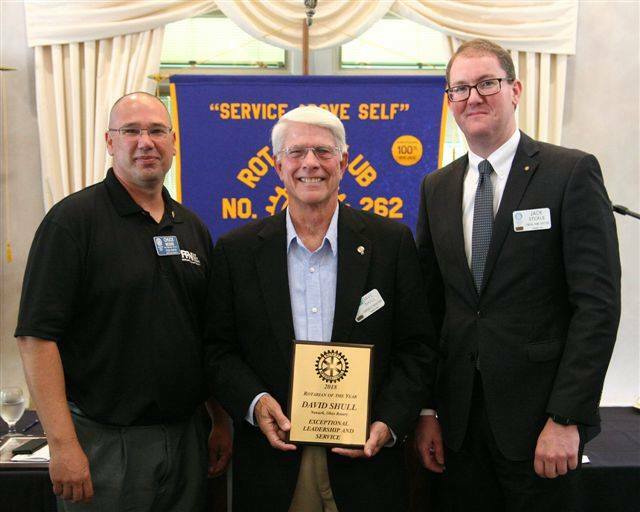 Krieg’s grandson Rob Drake served as president of the Granville Rotary Club in 1993-94. Project Camp Enterprise (now called Free Enterprise Academy) was started June 1975. This has been one of the most successful activities the Newark Rotary has ever promoted. Patterned after Columbus Rotary’s Freedom Foundation Program, the club invited 30 high school junior boys to the YMCA Camp Nelson Dodd for a four-¬day session to learn about the free enterprise system. Rotarians and other community leaders delivered an outstanding program to an enthusiastic group of young men. Aside from learning, there was opportunity for many outdoor activities which added even more excitement to the opportunity to find out what makes our business system work. This is now an annual effort which has been expanded in size (there have been as many as 100 participants) and includes both young men and women. Besides a great experience for the young people, the club membership has been benefitted from this opportunity to communicated with this fine group of young people. At one time or another over 90 percent of our membership has been involved with this project of service to youth. In the early 1980’s, District 6690 adopted a project to provide safe drinking water to a Rotary District in Honduras by drilling water wells. Our club was so enthused that, through the efforts of individual Rotarians and the membership, five wells were provided. In 1986-87, Rotary International’s Project, PolioPlus, was supported by the Newark Rotarians by contributions totaling $214,000, the largest amount from any club in the district. The club’s numerous projects made it necessary to find a means of funding them. 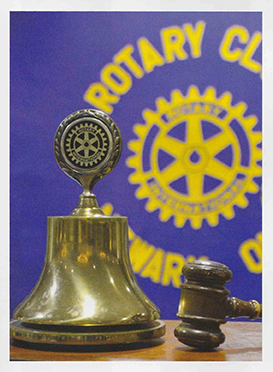 In 1982, a Newark Rotary Auction was established as a fundraiser for the club’s many projects. This is now an annual event with over $50,000 being raised at the latest auction. These funds are placed into the Newark Rotary Foundation account (established in 1988) from which they are then dispersed for such projects as scholarships to OSU-N and COTC, Free Enterprise Academy, special needs children, water fountains along the bike paths, and AED defibrillators to emergency squads in the Newark area to name a few. Two special projects of more recent origin include a picnic pavilion and a Read With Me program. In 1997, the club raised $230,000 from its members and built a picnic pavilion on the Newark campus of The Ohio State University. It is located along side of the bike trail and next to OSU’s Tartan Field. This facility includes a separate restroom building, the 2,000 square foot pavilion and its paved parking lot and drive, and 20 eight-foot-long picnic tables. The Read With Me project started in the year 1998. The club provides mentors from its membership and their spouses to have a one-on-one reading program with over 300 children who are at risk in the Newark school system. 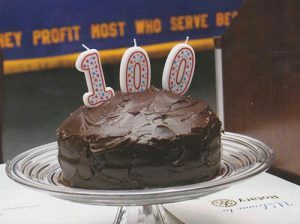 In the year 2003, we were asked to pick a project that would represent the club for the 100th birthday of Rotary International. The Newark Rotary Club chose to build a 14,500 square-foot Playground adjacent to the Rotary Pavilion on Sharon Valley Road. The architect’s estimate of the project was $702,000. In the spring of 2005, ground was broken for the project. With the help of the Newark Rotary Club over the course of six weekends, and that of the general contractor, the playground was constructed and officially dedicated on October 24, 2005. Contributions from a very supportive community, as well as Rotary members, paid for the park in just three years. The final bill for the park was just over $600,000. Newark Rotarians contributed close to $100,000 in personal labor in addition to approximately $200,000 in pledges over the three-year period. Today the Newark community has one of the finest handicapped-accessible playgrounds in Central Ohio, which is attested to by the daily number of cars bringing children to the playground. In preparation for its 100th anniversary in 2016, the club made plans to expand the park and make additional improvements at an estimated cost of $500,000. They broke ground on these upgrades in 2015. The updates included surface replacement, additional parking, a new entrance, and a smaller picnic shelter as well as wheel-chair accessible picnic pods. The great thing about Rotary in Newark is the activity of its members. The leadership of many area volunteer organizations has been provided by Rotary members. A list of these opportunities in service would take several pages and still would not be complete. It should be sufficient to say Newark Rotarians are active, hard-working examples of “Service Above Self” to their fellow citizens.